A few months ago we learned about who our enemy is and then most recently we learned about the SWORD OF THE SPIRIT. Click HERE to read "SWORD OF THE SPIRIT"
Our God is all powerful, all knowing, He is our Protector and Provider - He would never throw us into a battle without fully equipping us first. Today we continue learning about the "full armor of God" and specifically "Prayer." This spiritual weapon "Prayer" is both a defensive and an offensive weapon. Not only does prayer protect us against the evil coming towards us but prayer also helps and protects other people around us from Satan's schemes. All we have to do is put it into practice and use this prayer weapon on a daily basis. As you can see by the highlighted verse above we must "pray in the Spirit on all occasions with all kinds of prayers and requests." That means that we can pray any time of the day, any season of the year, we can pray in any place or in any situation. "All kinds of prayers & requests" means that we can pray for everything - nothing is too small or too large. That means both extremes and everything in between - you can pray for healing of a hangnail or healing from cancer. Large and small and everything in between. Also, pray anytime and anyplace. 4. Ask - the last thing is the list of requests. For this step I always try to pray for all of those around me (family, friends, neighbors, strangers, worldly figures etc) before getting to the personal "I need" or "I want"
"With this in mind be alert" - Just as important as requesting and asking is being alert to hear God's response. How could we ever hear anything if we are constantly talking? - The other part of prayer is being quiet, listening and then doing whatever it is that God tells us to do through the Holy Spirit's urging. Keep in mind that the answer might be "no" or "stay where you are" or "continue on the same path" - we must put our selfish desires aside and do what God is urging and guiding us to do. Also, being alert prevents an attack from the evil one - being alert protects us from deceivers and false prophets. Prayer is so amazing!!! - Do you have any idea how powerful and awesome this Spiritual weapon is??? All you have to do is think your prayer! - say it in your mind & God will hear you. It does not have to be verbal or said out loud - prayer is an internal and personal thing just between you and your Maker. And, other people in your life don't ever have to know that you are praying for them! Sit back and watch what God is doing in their life all the while knowing that you had some part in that because of your diligent prayers. Now again, I have to be clear - we must NEVER become arrogant and think that we are the reason for some good in someone's life. Yes, we might have prayed for that person but God is the one who does the miraculous works. We as Christians are just God's vessel - God working through us and God getting all the glory. 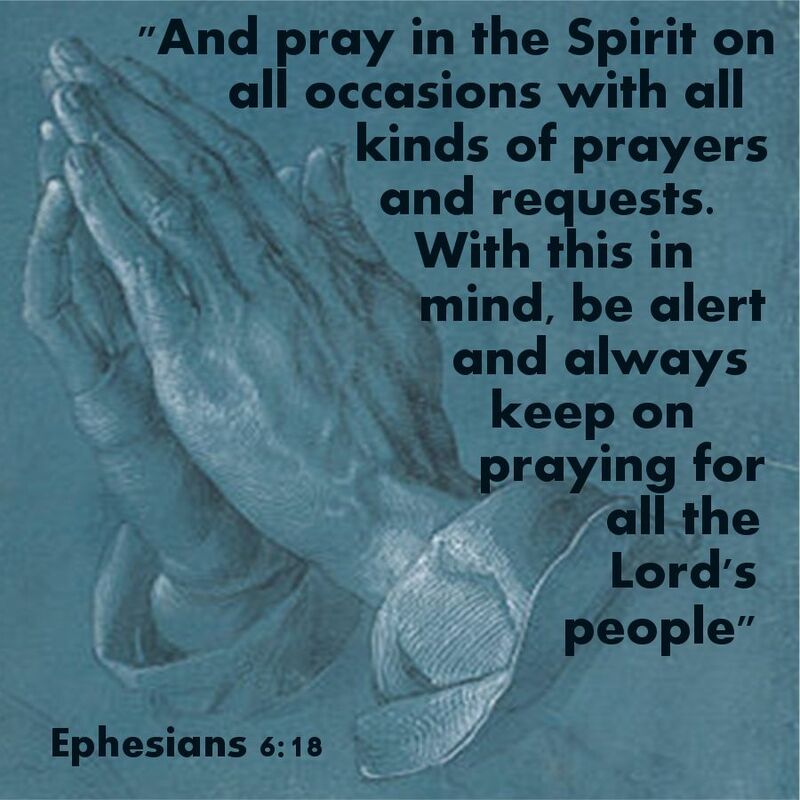 Please pray continually in all situations, anytime of the day, anywhere in the world and for anyone! Prayer is the ultimate Spiritual Weapon! !